Vapors—the umbrella term for hysteria, mania, depression and other illnesses ascribed to women—is focused on historical concepts of madness and its treatments. The title also speaks to the nature of poetic performance, that it exists in a moment, that it can impact despite its ephemeral state. The series was founded and is currently run by Ruby Brunton and Melissa McDaniel. Short prose, poetry, and performance art, although we are open to expanding to other mediums and genres. We invite 6-8 readers to read for ten minutes, with a short break in the middle of each reading. We move around. 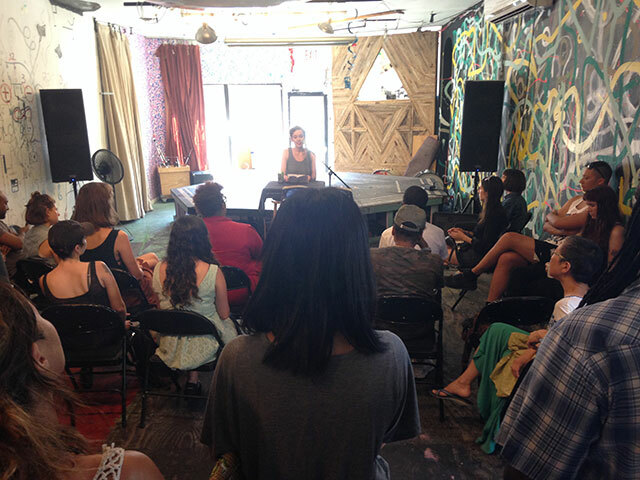 Our first reading took place at Silent Barn: a volunteer-run DIY venue and artists residency in Bushwick. Sadly, a fire destroyed part of their building in September, displacing their residents and damaging part of the performance space. We hope you’ll donate to their recovery efforts to help them get back on their feet. The series does not yet have a yearly schedule, but we aim for four or five readings per year. No official website yet, but you can find the info for upcoming readings on our personal pages: Ruby’s Twitter @rubybrunton & Tumblr, or Melissa’s Twitter @melissamcd29 & Tumblr. The majority of our readers are solicited. However, we are interested in hearing from talented new voices. Those who would like to read at a future event should attend the next Vapors reading and speak with us in person or email rubybrunton@gmail.com. Vapors is still in its infancy. Our ultimate goal is to provide a platform for artists who struggle to find a place for themselves in the mainstream literary community, and a space to create and explore new work related to the theme. Each event in this series is focused on a different aspect of madness, and we encourage our readers to explore this theme in their performances. We strive to feature diverse writers that have a unique perspective on madness and its implications. The next Vapors reading is scheduled for Wednesday, January 20th, 2016, at 7:30 p.m. at Babycastles and features Ruby Burton, Che Gosset, Melissa McDaniel, Muna Mire and Kristie Shoemaker.